Here is a step by step guide on how to use Trunk Club Women and what I got for a holiday party. You’ll be prompted to answer a series of brief questions. First, you specify your preferred style, what you’re shopping for, clothing colors, patterns, etc. Then you’ll answer body type-related questions, like areas on your body you’d like to disguise, and what fit of jeans you prefer and what you’re looking for in shoes. Finally, you’ll give some price ranges that fit your budget and, favorite brands. Presto! Your account is set up. Step 2: One of Trunk Club’s stylists will contact you to get more specifics on what you’re shopping for. They’ll create a virtual “look book” before your items are shipped, so you’ll be able to edit what items show up at your door (i.e. omitting ones you know you wouldn’t wear, not your style, etc.) You’ll also have an opportunity to give your stylist feedback, so they’ll be able to refine what items they pick for you or add anything that is missing. Your trunk arrives at your doorstep! Take your time trying on each item, so you see what you’d like to keep. My stylist Lyndsey even sent me ways to style each outfit. After trying everything on, you’ll be able to give feedback (i.e. item is too big, own similar item, didn’t fit, etc.) After you have decided what you want to keep you schedule a pickup via the Trunk Club app and it’s as simple as selecting the day, Trunk Club sends you a shipping label and you set it on your porch. DONE. It doesn’t get any easier than that! Another great perk of Trunk Club is if you need anything altered, all you do is take the item(s) and your receipt to any Nordstrom; they’ll take care of the rest. I am loving all the holiday decor. This OOTD inspired by my Christmas tree. Here are some similar pieces I am loving too. This is the ultimate gift guide for grade school kids age 5-10. Here’s the Scoop: I talked with Logan’s teachers and my friends who teach grade school and they gave me the best ideas of fun activities and games they use at school that the kids LOVE. The holidays will be here before you know it and your kids will be making a laundry list of things they want. If you’re tired of your kids getting junk that they don’t play with the day after Christmas you have come to the right place. Forward this gift guide to the grandparents, aunts, uncles, anyone who wants to know what your child wants for Christmas. Everyone will feel good about giving your kiddos something fun that will also stimulate their mind over the long Christmas break. This gift guide is organized for recommendations I got for kids age 5-10. Playstix, the toy that inspires kids to build extraordinary things. Playstix have grooves that interlock and they are color-coded to make building easy. Kit Includes Playsitx and idea booklet with instructions and examples of things you can build. My son is obsessed with these. He loves building houses for his stuffed animals. Magna-Tiles® Clear Colors 37 Piece Set by Valtech provide hours of educational, creative play. Each magnetic tile is translucent, brightly colored and basic geometric shapes easily connect for open-ended, constructive play! Children of all ages develop math, science, and fine motor skills while having fun. Design flat, 2-D patterns or build in 3-D! Children become familiar with 2-D, 3-D shapes, and math concepts learned in school. Build with Magna-Tiles® Clear Colors on a light table, with a flashlight, or near a window for a cool stained glass effect. Try Magna-Tiles® on the refrigerator or other magnetic surfaces. Magna-Tiles® shapes measures 3 inches per side. All Magna-Tiles® products are compatible. Includes 18 Small squares, 2 Large Squares, 7 Equilateral triangles, 6 Right triangles, and 4 Isosceles triangles. Race in a head-to-head competition with Blink, the lightning-fast card game! Play all the cards from your draw pile to win the game! Tenzi is the world’s fastest dice game! Fast, fun, engaging, and surprisingly intricate, Tenzi is perfect for tabletop beginners and aficionados alike. HOW TO PLAY: Every player gets 10 dice. The object of the game is to roll the dice as fast as possible, the player who gets all dice on the same number and yells “Tenzi!” is the winner. FUN AND EDUCATIONAL: While the basic game of Tenzi is approachable and easy to learn, there’s a world of strategy needed to win. Players must be quick to identify what number is best to try and get 10 of based on their initials rolls, and the stratagem only gets more in-depth as you play. Winner of over 35 Best Game Awards! Perfect for travel • Play solo or with a group. It’s not just bingo. It’s Zingo, a matching game that encourages pre-readers and early readers alike to match the pictures and words to their challenge cards. The Zingo! Zinger dispenses tiles and fun as young minds quickly race to be the first player with a full card and yell “ZINGO!” With two levels of play, this matching game builds language skills through fast-paced play. When I pick Logan up from after-school Adventure Club the kids have hovered around the Geo play table. The options are endless. Logan had built a spaceship. Once they are done you can quickly take apart and store. TOYS THAT TEACH: GeoPlay from MindWare is a great way to introduce your child to geometric shapes. CREATIVE PLAY: Enjoy hours of fun creating free-form sculptures using your imagination. 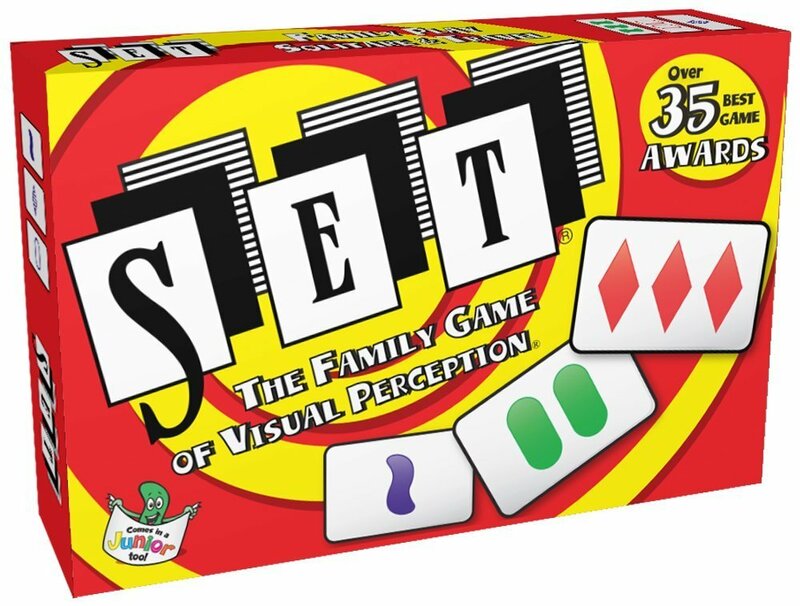 PRE-MATH AND LOGIC SKILLS: Identifying shapes and colors, understanding balance and reasoning, along with the concept of sorting are just a few benefits of playing with this kit. Are you a quick-thinker, have a good eye, or just always seem to get the luck of the draw? This brain-bending game can be played three different ways, making it great for all types of kids. Each player tries to recreate the card pattern drawn using their set of 16 cubes. Each level will offer a new challenge, as you race to get your ‘bitz in order! A great game for sleepovers or family night. It’s more fun when it’s Wacky! Kinetic Sand is the squeezable sand where you can FEEL the fun! You’ve seen it before, but you’ve never felt anything like it! Pack it, pull it, shape it and love it, Kinetic Sand is so incredible you can’t put it down. It’s kinetic – meaning it sticks to itself and not to you! It oozes, moves and melts right before your eyes. It flows through your fingers like a slow-moving liquid, but leaves them completely dry. Kinetic Sand stimulates children’s creative skills allowing them to create anything they can imagine over and over again. Kinetic Sand never dries out and is gluten free. This soft and stretchy sand easily cleans up while delivering non-stop fun! It’s squeezable sand you can’t put down. Feel the difference with Kinetic Sand! Using brightly colored, multi-shaped wooden blocks, the goal is to turn 2D images into 3D structures. Some build-outs seem to defy gravity; others are stunning works of dimensional art. All puzzles will challenge kids and adults while providing a rewarding, towering finish! Includes 22 high-quality wooden blocks, 20 cards with 40 puzzles to solve and a 9-inch square wood tray. The great thing about Legos is not only are they great to keep your kids occupied and help with following directions and building but depending on what your child in into they have so many themes and options. These will be huge in our house this Christmas. Create your own LEGO® vehicles with LEGO Classic! The LEGO® Classic Medium Creative Brick Box inspires open-ended building play and vehicle creation in a wide range of colors. Designed for builders of all ages in mind, this collection of LEGO® bricks in 35 different colors will encourage open-ended building play, and inspire any imagination. Windows, eyes, and lots and lots of wheels add to the fun and offer endless possibilities for creative construction and vehicle play. A great supplement set to any existing LEGO collection, this set comes in a convenient plastic storage box and includes ideas to get the building started. All of these gift ideas were recommended by son’s pre-school teachers. These are some of the hottest items kids love, that are not only fun but have some educational component. One thing is for certain, these gifts will not be gathering dust! Forward this gift guide to anyone you know who’s purchasing a holiday gift for a child age 2-5. Family members and friends alike will thank you! The Learning Resources Pretend & Play Calculator Cash Register is great for growing imaginations. Realistic money and a working calculator add to the fun while simultaneously helping to build math skills. A winner of the Best Classic Toys Award, it’s a must-have addition to any child’s toy collection. Give your kids endless hours of engineering fun with the Mindware Marble Run game. This engineering game gets the fun rolling, literally. The kids can build tracks that twist and turn with colorful pieces that simply slide together. They can test their design by sending marbles through chutes, merry-go-rounds, windmills, S-curves, a U-turn slide and centrifugal funnel, then make adjustments to send it off again. Kids can roll, cut, press and mold their way back to school, identifying their ABCs and 123s as they play! Wooden blocks never go out of style, and this classic Melissa and Doug block set will keep your child busy for hours. This 100-piece set in bright beautiful colors is the ultimate for creative building and constructing. Get creative-on the go-with the Design & Drill Take-Along Tool Kit! Kids use an electronic screwdriver to screw colorful bolts into custom pictures and patterns. When it’s time to pack up the fun, all pieces fit in the storage case. Requires 3 AA batteries (not included). Indoor Snow That Is Easy To Mold and Can Be Used Over and Over Again! Super Soft and Smooth Texture That Feels Lighter Than Air! Set Includes 6 Snowball Molds and 150 Grams of Floof Clay. Patented 360-degree front axle rotation. Radio Control, 49 MHz. Requires 5 AA batteries (not included). Magic Tracks are amazing tracks that bend, flex and glow! The Mega Set includes two battery operated cars that light up and 18 feet of track. Kids can connect the tracks in any configuration. This set will provide hours of fun! This kit includes a variety of tools to create fun scenes that encourage creative storytelling. With all Color Wonder products, the inks and markers won’t color on skin, furniture or fabric and ONLY color on the special Color Wonder paper. A gift card to Kidzxplor. I can’t say enough good things about Kidzxplor. I first started using their app last Christmas break, and I was amazed how awesome it is. If you have active kids who love doing new things, give Kidzxplor a try. Their app has tons of activities all over St Louis. Buying through Kidzxplor is extremely more affordable than purchasing directly through the companies, and allows you to try classes before you make a long-term commitment. Here are some of my 3-year-old’s favorite places through Kidzxplor : Little Fishes Swim, My Gym, The Little Gym, Vetta Soccer, Kokomo Joe’s, All American Gymnastics and Rockin Jump. Fitting room frenzy at J Crew Outlet. This past weekend I made a whirlwind trip to the Premium Outmall Mall and had to share some of the cute coat finds from JCrew Factory Outlet. Everything is on sale. I love winter coats because I work in and out of my car all day long. There are some days I don’t take my coat off so I’m always on the lookout for cute coats each season. Here are five of my favorite coats from JCrew factory outlet. For more expensive pieces in my wardrobe I tend to have a classic style. That is why I ADORE this wool topcoat. I cannot decide what color to buy. I tried on a size 6 in the navy and it was too roomy even with the sweater on. The camel/sand color I tried on the size 4 it fit great but if you tend to wear heavy bulky items in the fall and winter it may be too snug. I’ll admit I love all things fur so I had to try this coat on. This was a size 4 and needed a 2. This coat tends to run really big so I’d size down one. In the fall I love layering with quilted vests while I’m out running errands, hiking with my boys, or even for a more casual look for work. They have 6 fun colors. This layer adds so much polish to an outfit. Then when you need more warmth they have the casual quilted coats. They are so comfortable and come in several colors. I wore a small and that size was perfect. These tops are fall and winter staples. The navy and white gingham button down can take you from work to weekend. I am obsessed with the navy and white striped waffle funnel neck sweatshirt. Its longer so it covers your rear. Perfect for jeans or with leggings and runs true to size. You will be weekend ready in a flash. Target Style Update: Hearth & Hand with Magnolia launched Sunday. Here are 5 Hearth & Hand pieces to update your dining table for Fall. These pieces are so versatile. I was excited to have some updates for Fall and Thanksgiving but they will easily transition for holiday. Starting with the cream X linen table runner as a base I added the garland on top. The color works perfect for my house and dining room. I used my existing chargers and plates and added the black and cream striped napkin. I am obsessed with all the beautiful fall colors so I wanted to stick to a natural fall look. I grabbed my pumpkin from Halloween and took my boys out on a nature scavenger hunt to see who could find the biggest leaf. I also cut some branches of pretty fall leaves and evergreen to fill in the faux garland. This is a fun way to decorate for Fall without spending a lot of money. On my mantle I used the decorative bowl and some textural balls I already had. I love decorating with texture while keeping colors neutral. It creates so many fun places to draw your eye. In the kitchen I had to have the beautiful 4 leg tray and it was time to trash my old potholders. This tray will make anything look amazing. The boys and I experimented with a 3 ingredient no bake cookie bark so we plated it up on the new tray. I’m a big believer for everything if you buy it, use it. It doesn’t need to be a “special” occasion to use fancy pieces in the kitchen. How amazing would a cheese plate look and taste on this board?